The extent of the remodeling becomes clear because of a photo of the original house, built in 1873, exists. 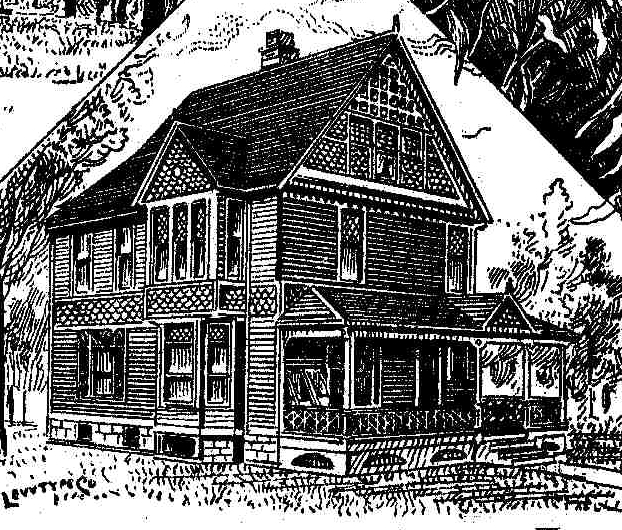 It shows a six room clapboard (wood) sided structure in the “front-gabled” Italianate style. This relatively rare variation of the style – although frequently seen in Rock Island – is recognized by peaked gables facing the front and sides of a rectangular house. This house had ornate wooden hoods –like tiny awnings — above tall narrow windows, carved gingerbread decoration on the gables and porches, and decorative wood brackets under the eaves. These details are less distinct in a drawing that was published in 1888. During the Tudor remodeling, the chimneys were rebuilt and a noteworthy lightening rod with a white ceramic knob was removed from the peak of the front gable. Even the fence was changed, although the photo of the original house did show a fence enclosing the large lot. Were it not for the placement of the windows and porches, today’s Tudor style house would not be recognizable as the original Italianate home. The first owners of the house were William and Charlotte Dart. Other members of the prominent Dart family owned at least three estate-type homes in this area during the mid to late 19th Century. The family was a local leader in the wholesale grocery business known as Henry Dart’s Sons, operating in downtown Rock Island. William Dart had this house built in 1873 with a loan for $3,000. The lot, at the corner of Adams and Guyer Streets in John W. Spencer’s Third Addition to the city, cost $992 in 1865. Before 1876, when Rock Island adopted a street numbering system, 8th Avenue was called Guyer Street. In 1895 the house was purchased for $6,500 by Edward Holmes Guyer. Edward (Eddie, as he was known as a youth) was one of two children of Samuel and Annette Holmes Guyer (for whom Guyer Street was named). He had spent his childhood in the family home nearby on the northwest corner of 19th Street and 8th Avenue. After their parents’ death, Edward Guyer’s sister continued to live in the family homestead for many years. That house, a hipped roof Italianate, is standing today. It is built of brick rather than the wood of the postcard house. Who’s busy building “Focus Town”. His handiwork is plainly seen. Parks, avenues and garden spots. To his method of practical addition”. He may have been a poet, and he certainly was not modest about his accomplishments! The extensive — $6000 — rebuilding of this house in 1910 to enlarge and convert it into a “modern” Tudor style home must have been quite a challenge, even for E.H.Guyer. The remodeled appearance is true to Tudor architectural details, with the design being achieved by use of a stucco finish over the original wood siding. Smooth cement trim gives the house the look usually provided by wooden timbers. It’s interesting that the Guyers did not replace the original Italianate double front doors, which have etched and frosted glass windows, and which are now hidden behind the Tudor style eight-light divided glass doors. 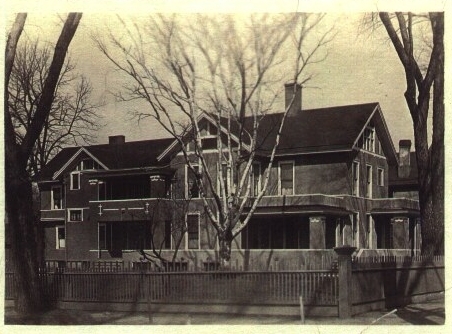 The addition mentioned in the 1911 postcard message included a large formal dining room, butler’s pantry, kitchen, second stairway and bedroom upstairs, all of which make up the back third of the rebuilt house. His funeral was held here at his home. Soon after, the home was sold to the Robert Reagan family. Mr. and Mrs. Reagan lived here until their deaths in 1978 and 1983. During those later years, the upper portion of the house was divided into apartments and changes were made to the exterior porches and grounds. Yet the Tudor style appearance remained, although the wood fence with concrete corner posts shown on the postcard no longer surrounds the house. A long carriage house with doors on both the alley and avenue sides was removed during the Reagans’ years as well. So who was Anna, the occupant of that “new” back bedroom? Not the Guyers’ daughter as we’d originally assumed – her name was Alice. Anna may have been a live-in servant, not uncommon for the times. But the more appealing possibility is that she was a literate, upward-striving country girl with a dream of higher education. In that era, young girls whose families lived in rural areas would help with household duties for city families in exchange for room and board so they could attend high school. In the Guyer’s case, Rock Island High School was only a very convenient distance block from their home. Despite modest changes over the past 90 years, the house today is readily identifiable as the same one on the postcard. And we can think of our unknown Anna when we look at the upstairs bedroom window on the far left. This article, by Jean Dasso, is slightly modified from the original, which appeared in the Rock Island Argus and Moline Dispatch on January 6, 2002.